The police in Ghana have arrested about four people who allegedly murdered and lynched a soldier in Ghana after mistaking him for an armed robber. 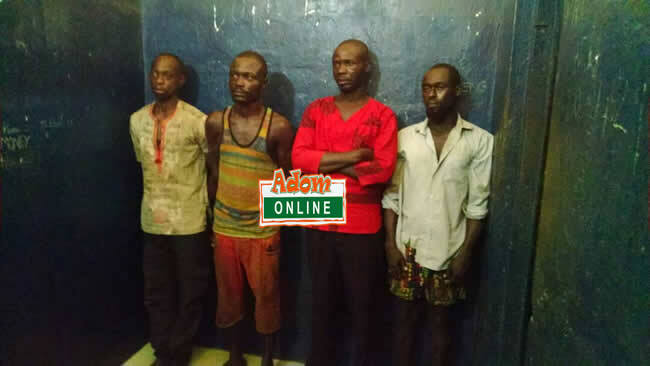 Four out of the five prime suspects have been arrested in connection with the lynching of a Captain of the Ghana Army have been sent to the Central Regional Police Headquarters in Cape Coast. According to Adom News, the fifth suspect who sustained bullet wounds during a struggle with the lynched Captain Maxwell Mahama is also at the hospital. They were paraded before the media by the police at the Regional Headquarters of the Police in Cape Coast as part of the investigations.